1 99 Lives Pause the game and press DOWN+C, UP, LEFT, UP, RIGHT, RIGHT, C.
2 Invincibility Pause the game and press UP+B, UP, RIGHT, DOWN, UP, RIGHT, DOWN, DOWN, UP, B. Unpause the game and pause it again. Press UP+B and you will be invincible. 3 Level Skip Pause the game and press LEFT+C, UP, UP, LEFT, DOWN, DOWN, RIGHT, C. You should hear a laser blast. Unpause the game, then pause it again and press RIGHT+C to skip a level. 4 Change Characters First enter the Level Skip cheat above. Pause the game and press LEFT+C to change characters. taking their rightful place as humanity's masters." Based on the popular serial by Marvel Comics. Fun Game... but there is only one problem.. it dsonet work on SEGA Nomad.. :( But its still a hell of a good game to play!!!!! I've been trying to find a copy of the second game for years, but I have, treasure, and still play the first one a lot. 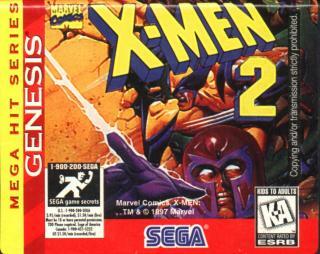 Although, the majot improvements in the second game were the inclusion of Beast and Psylocke (my favourite X-Men). I'm sorry, but I HATE HATE HATE HATE HATE X-Men 1. I was so pissed at it that I got pink eye, rubbed my eyes with the cartridge, and returned it to the Sega company asking them to fix it. . . Okay, so that really didn't happen, but I still hate X-Men 1. 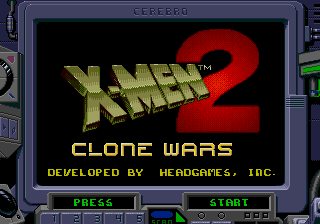 Now X-Men 2 was pretty cool. They redid the gameplay, added some more characters, and called in a new level designer. 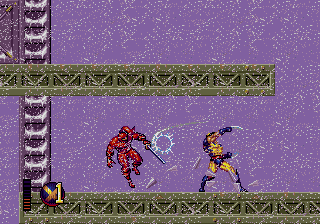 . . .well, actually they did with the Marvel Super Heroes game for SNES. Hmm. . . I guess there's no hope for the X-men. 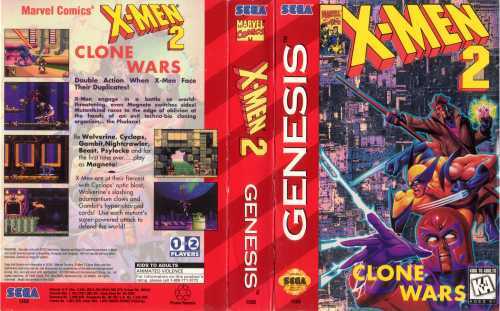 X-men is cool I like X-men on movie I seen First and Second one we have X-men 2 I like that movie we seen X-men 1 at time ago Cyclops, Jean Grey, Spyke, Wolverine, Storm, Rogue, Shadowcat, Nightcrawler, Pressofer X, X-men:Evolution I like Shadowcat and Wolverine I watch that show they made of movies too.